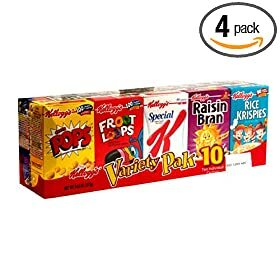 Amazon Grocery Deals – $49 in Kellogg’s groceries for $21.65 Shipped! STEP ONE: Go to the Amazon Kellogg’s page and pick out $49 in groceries that you would like to have. STEP TWO: Sign up for subscribe and save to get an additional 15% off (just cancel it after you purchase the item). STEP THREE: Checkout using the coupon code ALLKELLG to get an additional $20 off! You can get $49 in kellogg’s groceries for $21.65 shipped! ($7.35 off for subscribe and save plus $20 off for the coupon code)! Of course you can mix and match so you don’t have to get that many. I am confused, it will only let me add one item then sign up for subscribe and save and then I canot add any more items. Please help with the order. Shoot – with subscribe and save you have to buy one item at a time so you would have to get more of the one item so you hit the $49 and then do the same thing with the second item (in a separate order). Previous post: Hurry! Kraftmade Kitchen Ideas Book FREE! !